Geosynthetic clay liner (GCL) is a non woven fabric-like material, primarily used for the lining of landfills. As professional clay liner manufacturer in China ,we only supply best products. Geosynthetic clay liner ( GCL) , is a reinforced GCL consisting of a layer of sodium bentonite between a woven and a non-woven geotextile, which are needle punched together. Geosynthetic Clay Liners (GCL) are high performance geocomposites that are used as an alternative to conventional compacted clay liners. Geosynthetic Clay Liners (GCL)consist of two layers of geotextile stitched together enclosing a layer of processed sodium bentonite. Bentonite is a natural sealant, and when in contact with water, swells to form a low permeability clay liner.Geosynthetic Clay Liners (GCL) have a long lasting resistance to physical and chemical break-down in harsh environments such as landfills and other containment systems. The Bentonite Mass unit weight from 3600g/m2 to 7000g/m2. 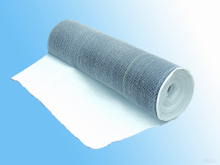 The Woven Geotextile Unit weight from 110g/M2 To 150g/M2. We have 2 set production line, 10000M2/day.